i have to say that laney was my main concern. she's got a bit of an independent streak in her. these days it comes out more often than not. and she has yet to master the art of an "inside voice" so there is really never any doubt as to how she's feeling about a particular situation. i had visions of screaming, thrashing, and gnashing of teeth. i was a nervous wreck before the appointment ever began. when it was finally laney's turn, we did what they call a "lap exam" meaning i held her facing me and laid her head back into the dentist's lap while he checked her teeth. she didn't have a cleaning, just a quick checkup to make sure all of her teeth were coming in as they should and that there were no major concerns. he scraped a little plaque off, applied a bit of fluoride to her teeth, and we were done! and laney didn't make a peep the entire time. apparently diaper changes by her mother are much more traumatic to her than having her teeth cleaned by a total stranger. go figure. while laney was having her exam, libbi got to color an ornament for the christmas tree in the waiting room. she was so proud to hang it up when we left! and she was even prouder of the prize that she chose from the treasure box. 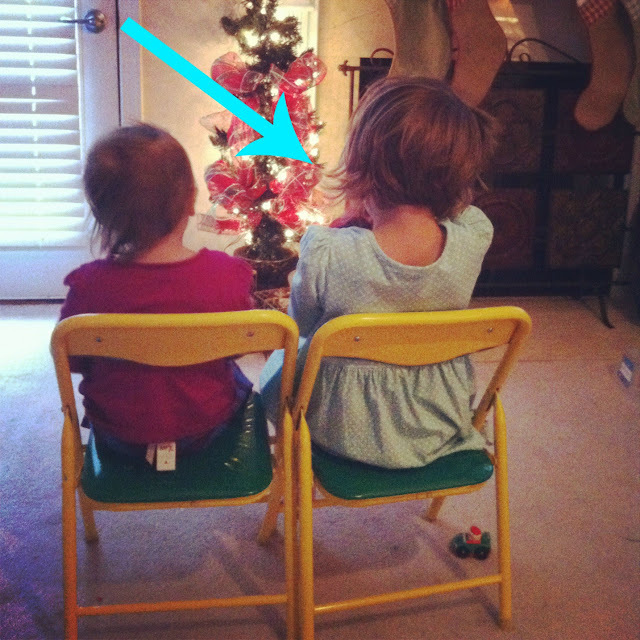 laney is admiring the tree, libbi is blowing up the whoopee cushion. trying to convince sister to sit on it. i'm just really hoping that six months from now when we return for our next cleaning, they'll have a different selection of prizes - ha!